You are here: Home / Bell Ringing 2018 Sign Ups! 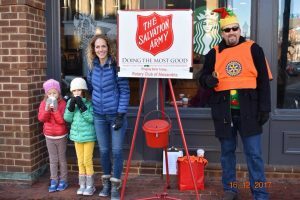 Rotary Club of Alexandria will be ringing the bells for the Salvation Army on Saturday, December 15, 2018. 08:00-09:00 Starbucks King & St. Asaph #1: Dan B. 09:00-10:00 Starbucks King & St. Asaph #1: Cathi C.
10:00-11:00 Starbucks King & St. Asaph #1: Rick B. 11:00-12:00 Starbucks King & St. Asaph #1: Donna W.
12:00-01:00pm Starbucks King & St. Asaph #1: Charles B. 01:00-02:00pm Starbucks King & St. Asaph #1: Mary W.
02:00-03:00pm Starbucks King & St. Asaph #1: Katy F.
03:00-04:00pm Starbucks King & St. Asaph #1: LP C.
07:00-08:00 Starbucks King & Union #1: Amy C.
08:00-09:00 Starbucks King & Union #1: Nancy V.
09:00-10:00 Starbucks King & Union #1: Lee D.
10:00-11:00 Starbucks King & Union #1: Jim C.
11:00-12:00 Starbucks King & Union #1: Lonny M.
12:00-01:00pm Starbucks King & Union #1: Peter K.
01:00-02:00pm Starbucks King & Union #1: Katy F.
02:00-03:00pm Starbucks King & Union #1: Raymond P.
09:00-10:00 Safeway on Royal #1: Patrick O. 10:00-11:00 Safeway on Royal #1: Charles L.
11:00-12:00 Safeway on Royal #1: Denny K.
12:00-01:00pm Safeway on Royal #1: John W.
01:00-02:00pm Safeway on Royal #1: Drew C.
02:00-03:00pm Safeway on Royal #1: Mike W.
03:00-04:00pm Safeway on Royal #1: John M.
04:00-05:00pm Safeway #1: Jack F.